I LOVE fried foods but with my health the way it is, I should not eat fried foods. Thank the Lord for an air fryer because it gives me food that tastes 100% fried but uses little to no oil. I strongly encourage you to purchase one. They are 100% worth the money. 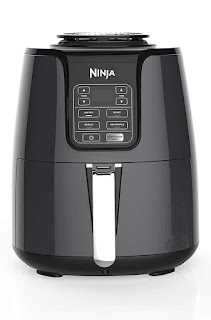 Not only does an air fryer "fry" food for you but it can also "roast" and "dehydrate"! We have made so many different foods with our air fryer and they have turned out perfect every single time. Crispy and delicious. Your food will also retain its moisture content also. Yum! To use an air fryer, you must preheat it. Our air fryer takes just 3 minutes and it is ready to use. Be sure to not overcrowd your air fryer basket. You must give your food enough room for the air to circulate. Ours can easily cook a big plateful of french fries at one time so you don't have to "baby" it...just give it some room. Halfway thorugh the cooking time, you need to shake the basket a bit to be sure your food will cook evenly. If the food you are cooking is delicate, like shrimp, or hard to shake, like big baked potatoes, then just use some tongs to reposition the food. When you are deep frying your food, you literally have to stand by and watch it carefully. With an air fryer, you need to shake the food once half way through the cooking time and that is all. One thing I really like about the air fryer is that it doesn't heat up your home like your oven or a deep fryer does. There is also very little clean up and I can cook virtually anything in the air fryer with ease. It also cooks so much faster than other things do without having to sacrifice on flavor. I will be sharing air fryer recipes several times a week so be sure to subscribe to my newsletter so you won't miss any. Here is one of the first things I made in the air fryer: Homemade Crispy Potato Chips! I have been curious about air fryers, so I appreciate this post! I'm glad you found it useful and thanks so much for stopping by.